In truth summer is the green season. 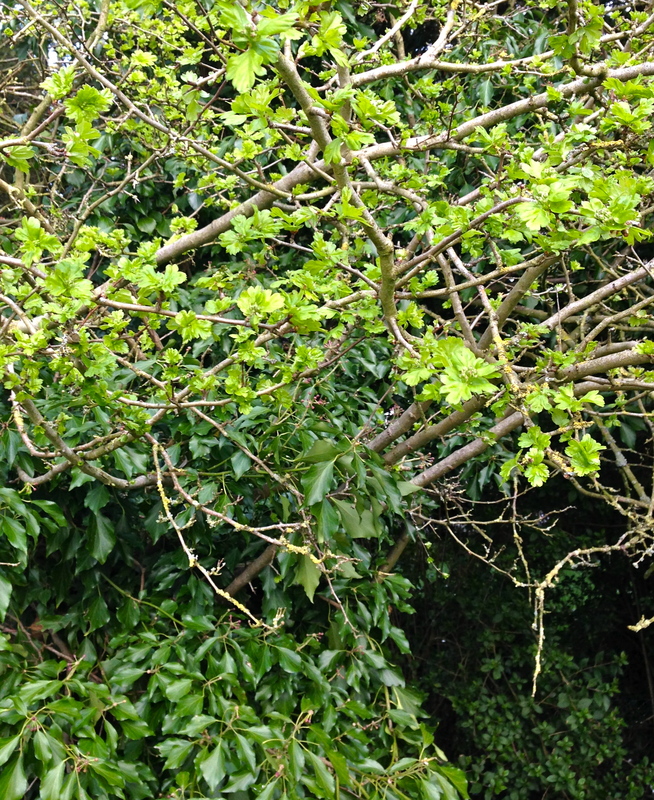 Blossom is over, and all the trees and shrubs are fully clad and positively verdant, assuming it’s not too dry. 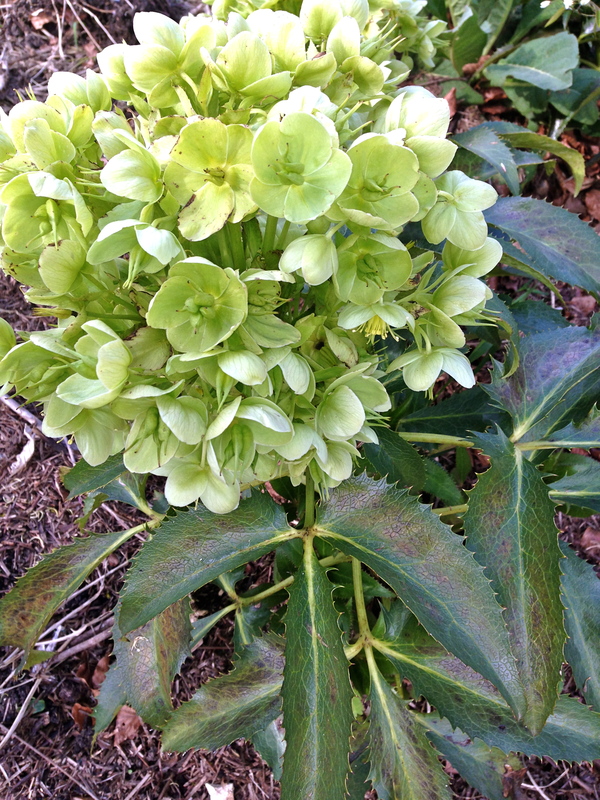 In summer however the greens can become a little one dimensional, the tones too similar, a green monochrome. In spring however, they dance all over the spectrum, from chartreuse to olive and back again, with everything in between. It is diverse, sometimes chaotic, occasionally unexpected, and almost always joyful. In my garden the ivy is graciously flattering the lighter, brighter hawthorn leaves, whilst the sombre yew is performing the same function for tens of others. Cardoon, gigantic and jagged, gives things a blue-grey thrust, whilst moss undulates in olive tones under the trees. 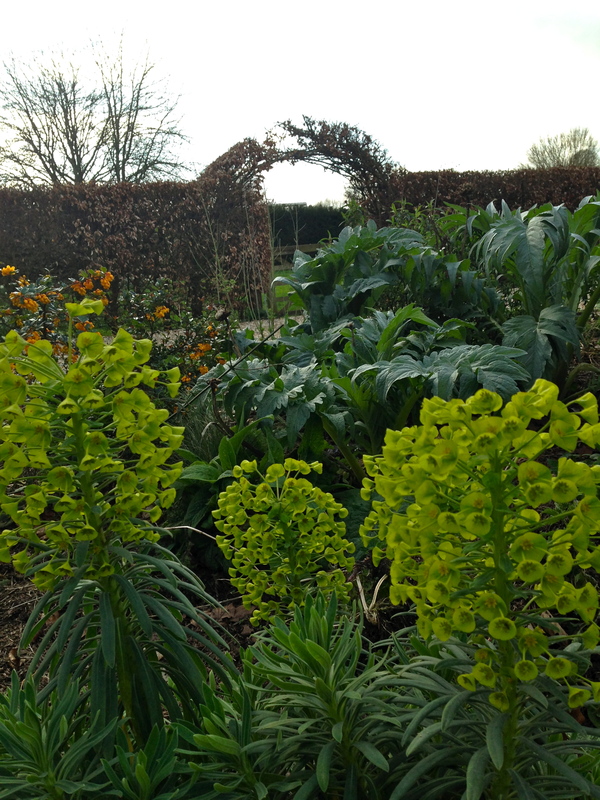 Even the flowers have joined the green party, with hellebores (Corsican, stinking and hybrid) in various shades of soft mint, and euphorbias in acid lemons and limes. Shame they’re both thoroughly poisonous really. Best of all are the beeches. We have a good amount of tall beech hedge, all already here when me moved in, and one truly beautiful, fairly old (70 years I’d hazard) beech tree. Now my inner jury is well and truly out on the beech hedge thing. I know they hold their leaves and all that, but in many ways that is my problem with them. They are so obstinately stoic, I find them rather difficult to stomach sometimes. And worse still, they come out late. When all the garden (except the black walnut, mutinous thing that it is) has come out to play, most of the beeches are still playing dead, miserable blighters. But now they are just beginning to show, and when they do I fall head over heels in love, all over again. 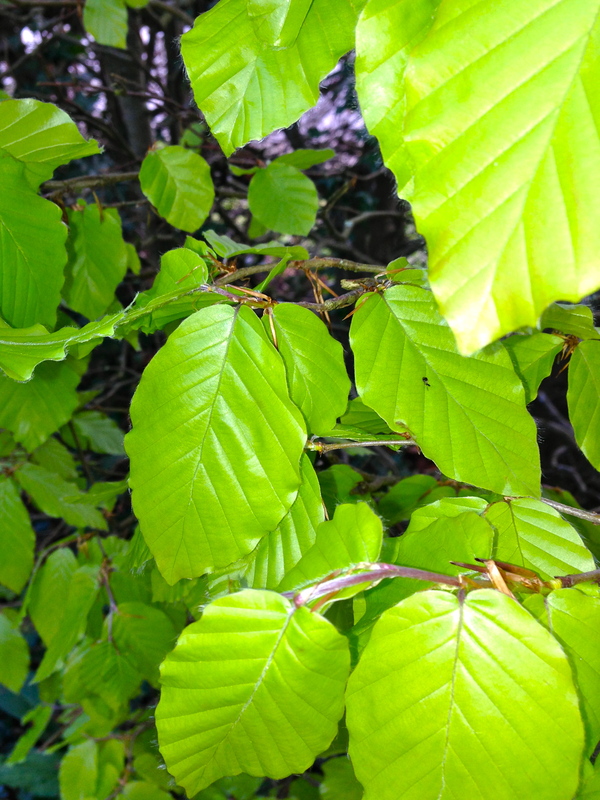 The green of a beech when it has very first come in to leaf is like nothing else. It is youth itself, utterly enchanting. Cleopatra’s salad days have nothing on it, trust me. It is the perfect green. You can even eat it, although I wouldn’t bother personally. I would simply stand next to it, and stare, storing up enough of its beauty this spring for me to forgive it another winter. * OK I freely admit that I did not come up with the title first. It was used by Robin Lane Fox ** in a newspaper article of his. I think it fits well though. ** Robin Lane Fox is an Oxford University ancient history don, and gardening writer. It’s not an obvious combination, but he carries it off beautifully. His “Better Gardening” is in my top 6 most read gardening books. That may not sound very high, but the competition is stiff, and there’s a lot of it. Christoher Lloyd holds all top 3 spots.